I was going to start with a definition of Romanticism. However, since the term is used in many countries with different definitions in every artistic endeavor, literature, music, and fine arts with more than 150 definitions according to Vermeylen, I shall refrain! After perusing several books ostensibly about Romanticism or Romantic artists that meet my criterion for the style I finally turned to my computer and looked at Wikipedia. There was an excellent article with 17 footnotes and a bibliography of about 25 books. Best of all their definitions of Romanticism fit my vision of the subject! “Romanticism (or the Romantic Era) was a complex artistic, literary and intellectual movement that originated in the second half of the 18th century in Europe, and gained strength in reaction to the Industrial Revolution (Bazarov) “Romanticism is precisely situated neither in choice of subject nor exact truth, but in the way of feeling” (Baudelaire). The Romantic Movement comes into full bloom between 1760 and 1850 but often looks back to medieval times with knights or images of Gothic ruins. Its peak, for me, occurs in Germany and Scandinavia between 1810 and 1840, when the artists gave their pictures a surreal feeling often expressed in the sky in an idyllic view. The artists that represent the epitome of the style are Caspar David Friedrich and Johann Christian Dahl (1788-1857). It is no surprise that they were also the teachers of a second generation of Romantic painters like Carl Gustav Carus (1789-1869) and Georg Heinrich Crola (1804-1879). 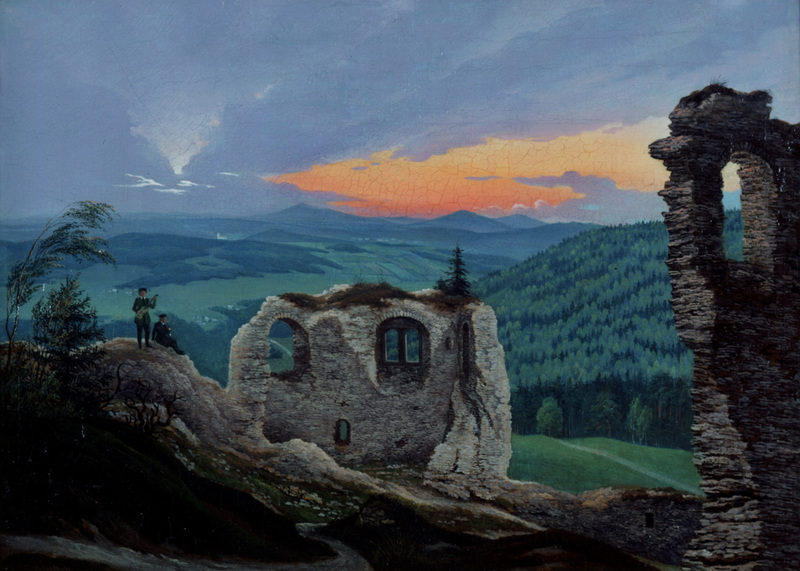 I have never acquired a great Friedrich but I did acquire a work by Crola. Our gem of a painting shows one of the favorite subjects of the Romantics, the mystical effect of a dramatic sky that dominates a landscape. We have attempted, more than once, to capture the painting’s effect in a photograph but the problem is that, while a photograph may record an image, it cannot capture the artist’s imagination. The color never seems quite right. The camera can never convey our gut reaction to a work of art. Our picture is titled “The Trollenstein Ruin Near Naumburg” and dates from 1826. It shows two small figures dressed in the attire of German university students on a hillside. One plays a guitar while his companion stares out at the breathtaking sunset. Below are the ruins of a church and an idyllic landscape of rolling hills. The painting inspires by interpreting the awesome vitality of Nature. I am sure we have all seen this kind of scene and tried to capture it in a photograph. I have only succeeded once, and that was on the Hopi Reservation. I had my camera out at the right moment stopped my car on the side of the road. I now have a computer screen background that I cannot believe was not created and touched up for a Kodak advertisement. Shortly after we acquired our Crola, Eric Zafran, curator at the Wadsworth Atheneum, told me that he had acquired a painting by Crola and it was the only one in a U.S. Museum collection. 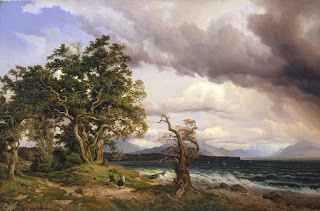 It is called “A Thunderstorm at lake Chiemsee”. The picture depicts two figures that have obviously just gotten their boat safely to edge of the raging sea as rush for cover. In both pictures the atmospheric sky and landscape dominate, while the figures give a story line and draw the viewer into the picture. Learning about the Atheneum acquisition made by a curator I respect, was a rewarding confirmation of my taste and eye. It was very comforting because I had gone out on a limb acquiring the Crola simply because I loved it.